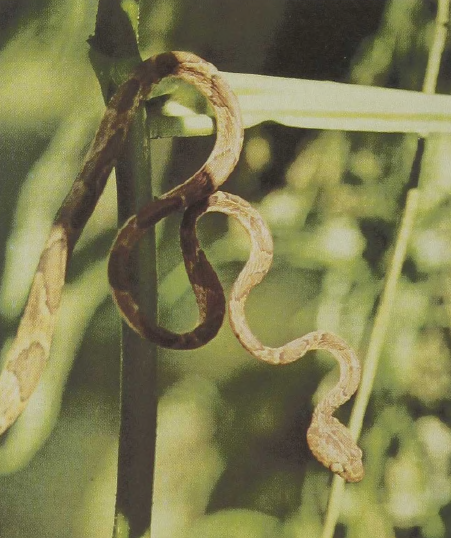 These small tree snakes of Central and South America, with their large heads and truly slender bodies, are the peak acrobats among snakes. Apparently they sleep coiled in branches of bushes and trees and only rarely descend to the ground. They can stretch out more than two-thirds of their 2- to 3-foot-long body in a straight line to another branch while stabilizing themselves with a simple coil of the tail. They are able to cantilever the body in this way because of the slender interlocking vertebrae which are held in position by slips of longitudinal muscles paralleling the vertebral column. They feed on lizards and some arboreal invertebrates, and their rear-fanged teeth apparently help to immobilize their prey. The advantage of this immobilization is obvious: such a slender snake could hardly have evolved if it had to struggle when feeding on bulky prey.